We do read, at 9591 Iris, we pick up a physical object called a book and we stare at it for hours, even days. 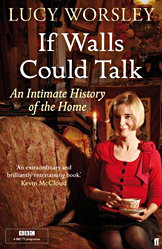 Right now, the book in our hands is If Walls Could Talk: An Intimate History of the Home, by Lucy Worsley. There is something in this quick little read for everyone, exactly because most of us share the experience of domestic life. We have rooms called bedrooms that are reserved for sleeping and personal privacy; other, purpose-built rooms where we carry out the rituals of personal hygiene, or cooking, or gathering together, or storage of our possessions. And we all have come to common understandings about the ways to deal with concerns like waste, body hair, cooking, and relaxation. Worsley ranges pretty far. Among her topics: cosmetics; beards; heating; the fall, and rise, of bathing; “the striking link between fancy manners and political absolutism”; how duvets revolutionized bedmaking; the arrival of the bathroom, which interestingly has a history of only decades, not centuries; and little excursions into things like shampoo, toilet paper, toothbrushes; the comfy chair; the recipe; the polite smile; and even the linchpin of my domestic existence, clutter. One of the things I admire about this book is its conclusion. I am a great reader of popular histories, and this is where so many of them fail, dropping the thread or dragging in the corpses of ideas never mentioned earlier in the text. Worsley’s final comments, though, are wonderful. With lightness and common sense, she talks about what may come next in our domestic lives: how the warming world, and shrinking resources, will likely reshape the practicalities of our home life: we will have fewer things, wash less often, and look out of smaller windows from smaller rooms. I think her vision is pretty rosy, but then, she comes from a part of the world where climate change is actually being addressed by public policy, so I understand how she would feel that way. This book is pretty Brit-centric. Her discussion of clutter, for instance, focuses on the Victorian mania for overstuffed homes, crammed with shoddy possessions, a behavior she links to social anxiety. This book was published just last year, but interestingly she avoids mentioning anything about the modern Western (and especially American) home, overstuffed with its own clutter. Look around you – if you are like most Americans, you are certainly not living in a spare, minimalist environment, surrounded by the bare essentials. You live in the midst of a lot of little things, and you chose to bring them into your daily life because they not only make your life more convenient but bring you pleasure. I love my clutter, actually. The piles of magazines, the throw pillows, the eccentric objects, the pictures. When I walk in the door at the end of the day, I am always glad to see my things. The picture above shows the objects I always take with me when I travel, all in a little bag. The plastic gun is left over from one of my children’s long-vanished action figures. The little spoon is what I used to give my kids their first solid food. 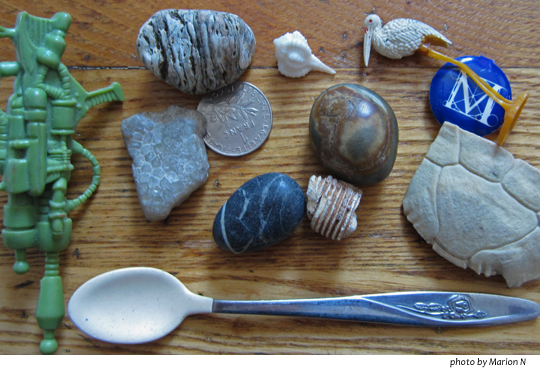 The bag also holds a French one-franc coin, a tiny shell from the Florida Keys, a fossil crinoid stem from Missouri, a lapel button from the Metropolitan Museum, a piece of turtle shell found in the woods in Missouri, stones from Nova Scotia and from three Great Lakes – Ontario, Superior and Michigan (yes, that is a Petoskey stone). I have no idea where that plastic stork came from, but it’s been in my life so long that it probably was not made in China. I don’t tote these things around out of superstition – they’re not religious relics. I bring them because they connect me to my life. My clutter is an emblem of my personal history and my domestic life. I love my clutter so much that I take it with me. This entry was posted in Uncategorized and tagged clutter, domestic life, Great Lakes, If Walls Could Talk, Lucy Worsley. Bookmark the permalink.